Spread on the smiles with smooth, creamy peanut buttery perfection. 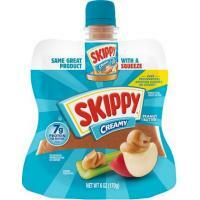 Skippy Creamy Peanut Butter adds more yum and fun to just about anything. It's nothing but smooth snacking with this creamy classic.